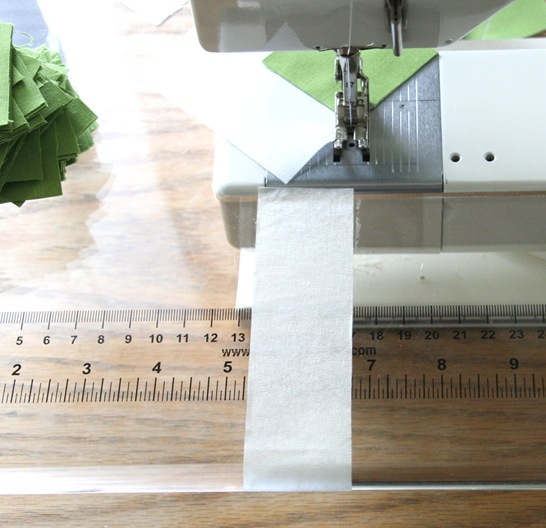 Place a piece of tape so that edge is in line with the needle of your machine. When you are sewing on your squares, start in one corner, and keep the opposite corner on that tape edge to keep the seam line straight. When your done you’ll have a nice straight line from corner to corner, without having to draw gagillions of little pencil lines. Keep in mind though that the smaller the square the easier it is, it might be a little harder to keep a perfectly straight line with bigger squares. Tricky huh? I learned this from my Mom. I always wondered why she had painters tape stuck to the front of her machine….now we know. This is an awesome tip!! I like to take shortcuts that work and this is one that I will definitely try. Thanks for sharing. That is a great little tip!! Thanks!! You are just too clever! Thank you! What a great idea! I just might try this…I don't like having to draw all those lines either. Thanks! Thanks! Better than drawing lines! I love you. I seriously owe you like a child or something. I was facing doing this for way too many blocks to fathom and was dreading the heck out of it. You're so clever! Thank you. Great tip! The quilt shop where I first learned how to quilt recommended that if we were having trouble keeping a 1/4 inch SA. Works great for these triangles, since I agree, who wants to draw all those lines! We want to get to the piecing and quilting part, right?! Painter's tape is my best sewing friend (besides my seam ripper). I love it. great idea for keeping it straight. Thanks for sharing! handy tip! thanks for passing it along! Oh how I wish you would've posted this 9 months ago… when I was drawing pencil lines on 123948102349824619286 triangles! Great post, I will definitely use this shortcut!!! Wonderful wonderful tip. Thanks for passing it along! Nice idea and once you set it up, it saves on the tracing step. Brilliance! Sheer brilliance! Thank you to your mom and to you for sharing with us. Well, how about that. What a great idea! Thanks for sharing!! Oh I just did a million little half square triangles for pinwheels. I will be using this next time. Yay thanks for this tip!! I'm so lazy when it comes to pinning and drawing, so this is a great tip for me! Painters tape is also good if you don't like pinning – I just stick it to one corner to stop the pieces moving. It loses it's stick reasonably quickly, but you only need a tiny bit and it's so much faster (and less hazardous LOL…) than pinning. Thanks for the fantastic tip! Sounds like you had a very clever mum. Thank you! Perfect! I was dreading dreading dreading drawing all those lines and now I don't have to. Great tip! thanks so much! I learned this in a quilting class. Now all my machines have tape on them. This is a great idea and I appreciate you reminding us of this. It simplifies and that is just what all of us quilters need. Wow! Neat trick…. I hate drawing all those lines. Great idea. Thanks to you and your mom. I hate the line drawing. Thank you for the tip, aren't mothers great! You and your mom are SO CLEVER! Thanks a bunch for this tip. PS There is a cream stick in Amishland with your name on it and a donkey or two missing you! I just love simple but brilliant ideas like this! Awesome! I wish I had thought of that last weekend when I was grumbling at all my little triangles! Thanks for the tip. I tried this trick yesterday, and it worked wonderfully. I cannot offer enough thanks!! It saved me SO much time making half-square triangles. how do u cope with the machine eating the corners? Use a little piece of fabric as a starter. Stitch on it first then onto the beginning of your corner. I was getting ready to start a quilt with these little triangles and said 'wait! I remember something about a trick to di these…. now where did I see that" Thanks !!! I love this trick! My addition to it is that I usually now will sew another seam about 3/8" away from the first one, but them apart with a very scant 1/4 inch seam, and then I save all those list squares to put into charity quilts/mini-quilts/other projects (especially if I'm chain piecing, since I can just run them all through the machine in line again, using my existing seam line as my guide (and my 1/4 inch foot is a little wider on the left, so it works pretty perfectly.) Probably silly, but I read a blog entry about getting extra charity quilts from scraps, and despite the fact that I have too much fabric and need to use it up, I've become a bit obsessed with reducing waste. Anyway, I thought I'd share (and at the same time thank you for this great tip – it has made my sewing speed up considerably)! So simple–what a great idea! I hate drawing those lines. Thanks! Along with everyone else, thanks for the tip!! 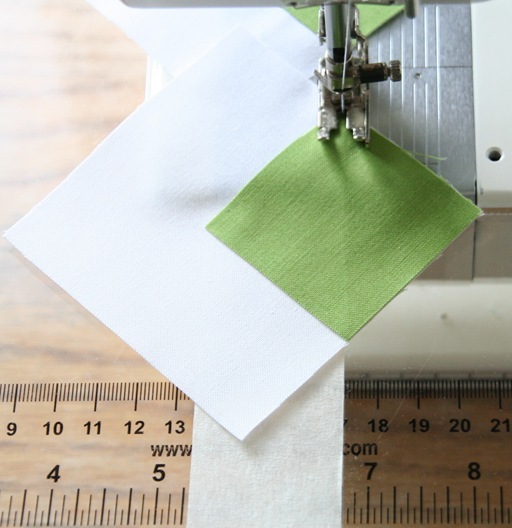 As a new quilter, I will take all the tips I can get to make my quilt turn out better. I'll be watching for more!! What an awesome tip! Thanks! This is the most life changing thing to have found on pinterest today. How is it that I didn't know this while drawing all those stinking lines for the Swoon quilt?! :) thanks for sharing!! a great tip. Can you share what you use these blocks for? Ive made HST but like the idea of the different sizes of these two pieces, making a block. Do you have a pattern for using them? GREAT tip! I passed along to my friend who does more precision piece that I do. You are so nice to share GREAT TIPS! This is a great time saver and helps to make more accurate corners! Way to Go! Thanks! Thanks for the tip, I will have to try this out…. I am new at quilting and I am right now gathering a lot of information/tips as to how to make quilting fun instead of work. I want to thank you for this tip. 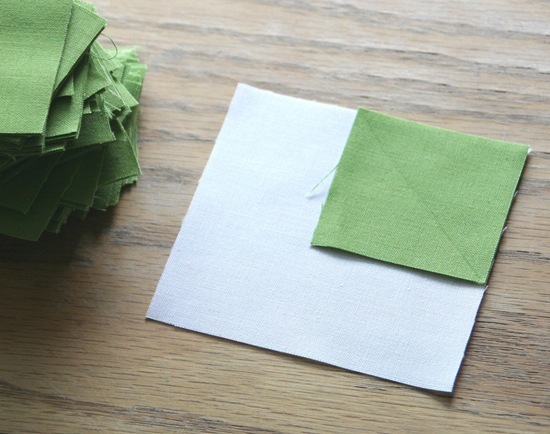 I hope you do not mind me asking this question, if I folded my square in half, finger press it or iron it once folded in half would that not give you a straight line to sew on? As I said I am new to this so if it's a silly question, I will laugh with everyone eles, LOL! Yes, I never draw lines. I press the squares in half on the diagonal and then sew on the line. But her tip is much faster. Thank you for getting back to me so quickly!!! I will file your tip away and be sure to use it with my first quilt. I love your blog and all of your great projects. I am looking forward to learning from you and referencing your blog frequently!! I am so happy I found you today!!! Happy quilting! Great tip! Thanks for the info!! Genius, just what I needed as I have a quilt pattern that is dull so putting it on point makes it interesting, many thanks!! What part does the ruler play? Or is that painted on your sewing machine cabinet? I suppose if you have a top loading bobbin in the way of the tape you break the continuous tape line up to fit over bobbin cover then resume the line of the tape as you suggested?? I’m definitely going to give this one a try.